Here is a small selection of the caravans we have available from Kendal Caravans. 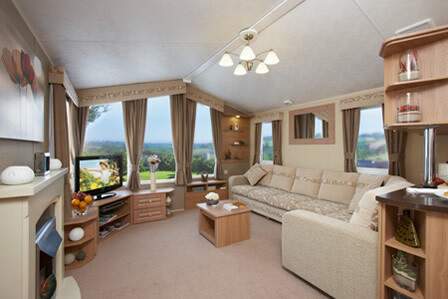 Please also take a look at caravans from our other caravan supplier, Lake, Coast & Dale Leisure. Established in 1988, Kendal Caravans is the only caravan holiday home distributor in the Lake District National Park, serving the whole of Cumbria, North Lancashire, The Yorkshire Dales, Northumberland, The Scottish Borders and Dumfries and Galloway. 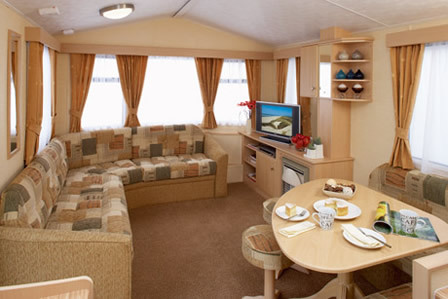 They maintain a wide selection of both new and used static holiday caravans for sale at our showground outside Kendal, in a peaceful country setting. Up to the minute new models from manufacturers Willerby, Swift, and BK Bluebird are all available to view. The latest incarnation of the 10ft Herald Gold builds on the pedigree of its predecessors. Compact design without compromise. With a rich specification that features many items that are usually associated with larger and more expensive holiday homes, this great value model is perfect for family holidays. An abundance of windows ensures that the lounge is bright and airy, with comfortable seating and fixed dinette, there is plenty of room to relax and unwind. The clean lines of the kitchen are complemented by a modern cooker and hob, with glass splashback and an electric extractor fan. Inviting bedrooms are given a warm glow by soft colour schemes and the functional shower rooms are enhanced by heated towel rails and spacious shower enclosures. 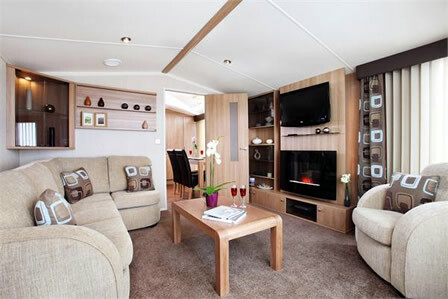 Herald Gold models are deceptively spacious, comfortable holiday homes that represent excellent value for money; without compromising on quality. A pedigree you can rely on. 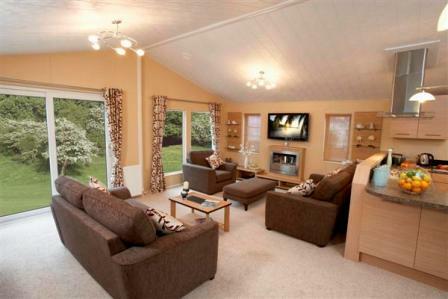 The Grosvenor represents a bold statement in holiday home design. The large L shaped sofa with reversible cushions is beautifully balanced by the feature 'stone effect' fireplace and walnut style cabinets. The spacious dining area creates the perfect link between the kitchen and the main living space, emphasising the open-plan layout and creating a real sense of space. Clever storage solutions, including a large cupboard in the entrance hall and overhead bedroom cabinets contribute to the incredible practicality of the Grosvenor. Generous main bedroom space is complemented by an en-suite WC in the two bedroom version and separate WC in the three bedroom model, making the Grosvenor an extremely luxurious holiday home range. The Chamonix range has had a complete makeover, making it look and feel more upmarket. All three improved layouts, which have increased in length, offer a spacious and elegantly styled lounge which features new soft furnishings, solid furniture in 'Romana Cherry' woodgrain, 'Winchester' wall covering and a sumptuous freestanding 'L' shaped sofa. The new luxury dining suite, with matching coffee table, includes leather look high backed chairs. The feeling of modern comfort is further enhanced with high specification features including luxury carpets with underlay, tasteful accessories including scatter cushions and standard lamp, a new 'Dante' electric fire in a contemporary surround, provision for a flat screen TV and new lounge and dining feature lighting. The double bedroom features a king-size bed with metal frame, beech slatted base and domestic-style sprung mattress to ensure maximum comfort and provide plenty of underbed storage. A revelation in lodge design; the superb styling and imaginative space planning of the all-new Boston combines to deliver an incredibly spacious open-plan model that is sure to delight, particularly when you consider the amazing price. Upon entering the Boston you are greeted by an enormous living space with numerous windows and sliding patio doors ensuring natural light reflects throughout the open-plan interior. Adjoining the kitchen is the extensive lounge area complete with two fashionable free-standing sofas, which are beautifully complemented by a modern fire with low-level cabinets and glass display shelves. Eye-catching ceiling pendant lights illuminate the dining area, which features a stylish wooden dining table with inset detailing and high-backed chairs. In the main bedroom the sumptuous 5ft bed, elegant side tables and wall cabinet blend to provide the ultimate haven in which to relax.